For stripping RG Cable : RG-58/59/62/6/6QS/3C/4C/5C. Manufacturer No: HT-332. Stripping Length: This stripper can strip cable in four lengths 4;6;8 and 12mm/ The stripping length is preset to 6mm. If you want to strip other lengths; you may adjust the blade's position. 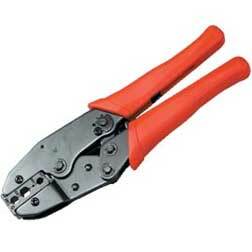 Coaxial crimping tools are used to compress or terminate cables during various electrical installations. Coaxial crimping tools come handy when doing installations at your home and office. No order them conveniently at the comfort of your home and get them delivered at your doorsteps. Among other products, our range of coaxial crimping tools include RG59/6 coaxial ratchet crimping tool, crimp tool for stripping cable RG58, RG 59, RG6 and RG62.